In the words of the poet Burns, “The best-laid schemes o’ mice an’ men/Gang aft agley”, but today we weren’t left with “nought but grief an’ pain” as instead of our planned trip to Pomegranate (which, all being well, with now open on Saturday), we headed over the road to long-standing pizza parlour favourite, Jolly, to sample its legendary £5.95 three-course lunch. We were joined today by Phil and Sandra, who had previously joined us on our trip to the Turkish Kitchen. Coincidentally, it was Phil who joined me when we visited Seadogs, just before it sadly closed, but today marks the phoenix from the flames resurrection of the place, albeit at the expense of smart Italian Amore Dogs, at The Dogs’main kennel on Hanover Street. It’s a welcome return to the fold for Seadogs, as we really rather enjoyed it when we visited. Phil and Sandra arrived laden with goodies for me, as it was time to replenish my supplies of www.tieclub.co.uk ties. Included within these was a panda tie, which Phil was sporting, today. Anyhoo, to the task at hand. Jolly is an establishment of considerable long-standing, which is a highly commendable achievement in and of itself. It’s main selling points, as far as I can gather, are its wood-fired oven, in which pizza delights are prepared, and the aforementioned value lunch deal. And the lunch deal seems to have enduring popularity, as not only was the restaurant more than half full, today, but it was populated by folks who looked very much like repeated visitors of long standing. For the sake of clarity, that back-handed compliment was aiming to say that some of the patrons were long-in-the-tooth, rather than wide-in-the-girth. The place is a classically styled Italian place. Could the decor use updating? Yes, very probably, but it would undoubtedly lose some of its charm, so keeping it as is seems fair enough to me. It’s the kind of place where improvements should be made incrementally, rather than a wholesale revamp, as and when the time comes. Service is welcoming and friendly, and they seem genuinely concerned about you getting enjoyment out of your time in their restaurant. Service wasn’t speedy, but the restaurant was busy enough for this to be straightforwardly explained away. 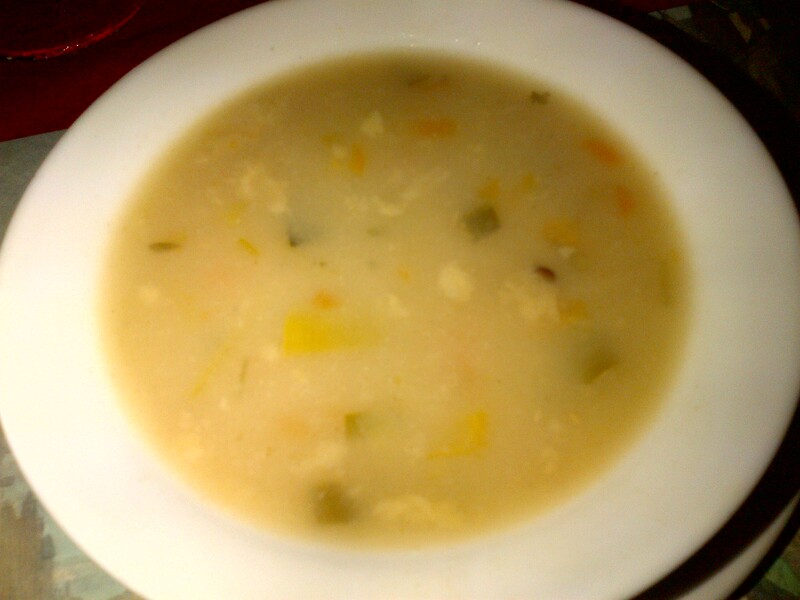 From their hand-written menus, offering five starter options and more than ten main courses, I chose chicken and leek soup, to be followed by their half pizza, half pasta option. Today, this combined a choice of either Bolognese or carbonara, with a simple margarita. These turned out to be pretty good choices. I strongly suspect the soup was from a tin, as while it tasted okay, it really lacked any sense of homemade character. The accompanying bread was of the sliced white variety. Essentially, to provide a three-course lunch for the cheap-as-chips price they offer, this is where the quality has been compromised. I don’t really have a problem with that, particularly given it wasn’t the worst bowl of soup I’ve eaten this week. The main courses was entirely more impressive. Aside from the sausage topping on Phil’s pizza (where, again, the quality was compromised, but this time in an entirely more unsatisfactory way), the pizzas were very good. My margarita had a nicely crisp base and the topping was just grand. The carbonara was good. As I may have mentioned in the past, noodly items tend to elude me. They are the subject of “food playtime”, and usually end up serving as much to spray sauce on my shirt and tie (in this context, my choice of white shirt, today, was brave approaching foolish) as to fill my belly, but today I was on fine form, and had a pretty good hoover at my large tray of carbohydrate goodies. It truly was a mountain of food, so much that none of us could face the dessert course ice-cream, to follow. I had a quick espresso, which was very good, then it was time for us to make good our financial transaction, then head off on our merry way. So, Jolly is a bit of a curate’s egg. The starters weren’t great, but the mains were very good. Overall, it’s a really good option if you’re looking for a large lunchtime feast, perhaps to be followed by an afternoon of hearty imbibing in one of the local hostelries. The pizzas are definitely their strength, with their full menu offering a wide array of choices, so should definitely be sampled during your visit. What an odd day. What was supposed to be an interesting and light lunch at Pomegranate, became a carb-rich pizza pasta mix of proper pre-night out food. When I had mentioned that we were going to the Jolly to my flatmate, I got a surprised smirk and comments alluding to the nearest Greggs, but I am happy to report that she was mistaken. When we arrived at the restaurant, we were transported back to Rome, circa 1976. The décor in the restaurant has likely not been touched since it opened many years ago, but to be honest, this doesn’t bother me in the least in an Italian restaurant in the UK. We sat for a bit and perused the menu until our guest-questers arrived. Then we asked many questions about the menu, which was written out on sheets of paper and were really quite large considering the 3 courses for £5.95 deal they have on. 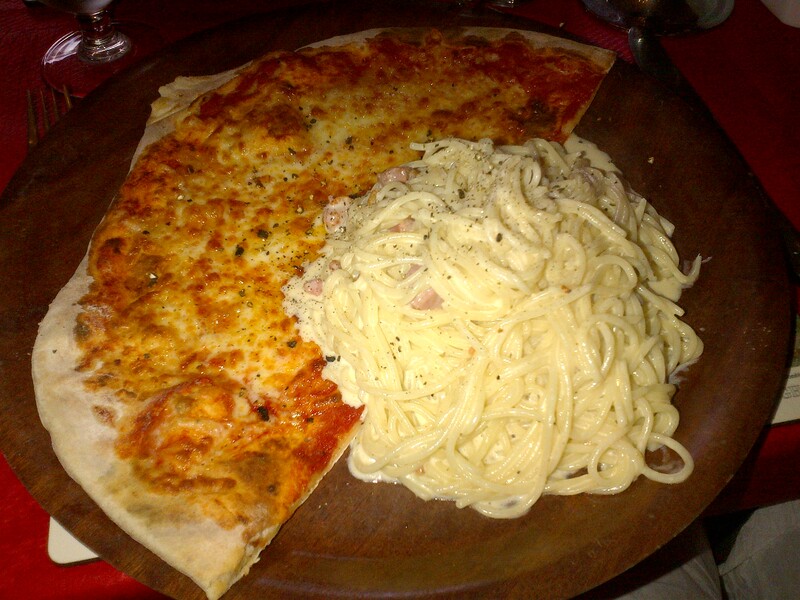 After our many questions were answered, I opted for the minestrone soup and the ½ pizza (no cheese) and ½ pasta main. The minestrone was a bit thin and it didn’t really do it for me on flavour. It could have used a bit of something to zing it up. And it was oddly served with a slice of plain white bread. However, the salad did look like a nice fresh garden salad, and I was a little jealous. When our mains arrived, the pizzas looked good and were of a nice, large size. My main of shells and bolognese and ½ a pizza with no cheese was good, but not stellar. I think that without the salty cheese, the sauce itself lacked a kick and the pasta could have used some salt and herbs. But that being said, the whole meal was £5.95, and it was a mammoth amount of food that I couldn’t even attempt to finish (and we didn’t even go for the dessert of ice cream). So, I think that the Jolly is a jolly good place to go for a pre-night out dinner or for a hungover lunch.